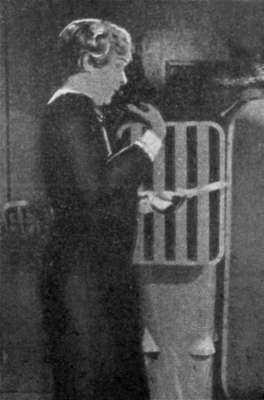 The following artical appeared in the January 1936 edition of Television and Short-Wave magazine. IT will be remembered that in April last  the French authorities commenced making tentative television experiments by the installation of a low-definition transmitter, and it was announced that the experiments would be progressive towards higher definition. Very little time has been allowed to elapse in attaining this objective for a 180-line television broadcasting station was opened formally on November 17 as a direct result of the experience gained with the low-definition system. 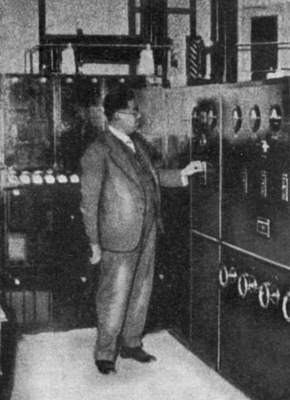 The latter, it may be remarked, operated with 60 lines and the transmitter had a power of only 200 watts. The new station is to work with 180 lines and 25 pictures per second. The power in the first instance is to be 1 kilowatt. which are used in the studio. The studio is in the P.T.T. broadcasting station, 103 rue de Grenelle, Paris, and it is really an old radio studio modified for television. Powerful projectors have been installed in a room about thirty-six feet long. There are six of these with a power of 5 kilowatts and twelve of 1 kilowatt, and because of the intense heat generated special arrangements have been made for ventilating and cooling the studios. As will be seen from one of the photographs [opposite, left of photo], ship's type of ventilators have been installed with pipes leading to a chamber where artificial rain is produced, the latter being kept at a very low temperature by means of a refrigerating plant. Fans ensure the constant circulation of air. The camera room is adjacent to the studio, being separated by a sheet of glass. In this room also are the amplifiers and controls. An underground cable of the special high-frequency type is used to connect the studio with the transmitter, which is situated in the base of the Eiffel Tower, about two-and-a-half kilometres away. 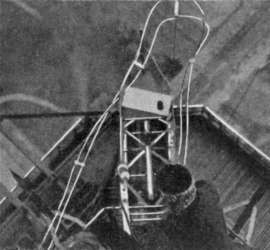 Connection to the aerial is made by another concentric type feeder, which consists of a copper tube containing a smaller insulated tube placed concentric with it. 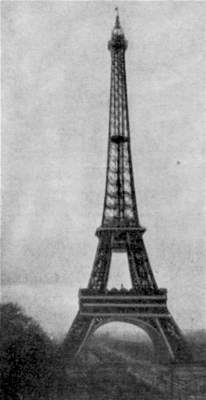 This passes up the north leg of the tower to the aerial which, as the photograph shows, is a four-wire arrangement in two planes. Scanning is accomplished with a disc which revolves at 3,000 revolutions per minute. This disc contains a double spiral of holes so that it makes two turns per image. For synchronising a separate disc is employed, which is positively driven from the scanning disc. Two synchronising pulses are transmitted, one at the end of each line and the other upon the completion of each picture. Realising that at present very few people will be able to receive these transmissions the authorities are arranging to install receiving apparatus in various parts of Paris, and these viewing rooms will be open to the public. It appears that it was only in September  that this latest installation was planned, and M. George Mandel, who is responsible for it, allowed two months for its completion. Actually in seven weeks everything was complete and ready for the first transmission. Considering that there was very little previous experience of high-definition work this is remarkable progress. The transmission created a great deal of interest and the number of applications to witness the first demonstration in the viewing rooms exceeded ten thousand. As this number of persons could not be accommodated other demonstrations were arranged and entrance limited to invitation. At the time of going to press no regular schedule has been arranged. Apparently some hitch occurred in the reception of the first transmission and only three of the receivers in the six centres were in operation. The French technical Press, commenting upon the result, observes that the clarity of the pictures was but little better than that obtained with lower definition, and it appears that there was a lack of brightness due to some fault in the receiving apparatus. In the Haut Parler, a journalist describes his experiences. He says: "I was invited to the television reception at the House of Civil Engineers. On the appointed evening I found a theatre and ball in full swing, but no television. A hand-written notice announced 'No television this evening' to a disappointed crowd. From there I went to Chemistry House—in time to see Lys Ganty singing. Two receivers were installed, side by side—the left-hand one showing the picture in black and white, the other in sepia. The latter seems to be taken from closer up. Thus in one case we saw the scenes pleasantly—while in the other the actors continually appeared to come out of the frame, and the canvas at the back of the scene was lighter than the objects. We were assured, however, that both apparatus were worked alike." 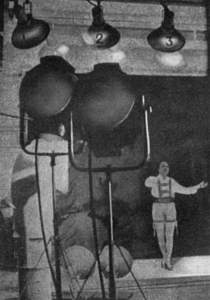 at the first television broadcast. The amplifier and control room.